Though I have had a blog for several years, my efforts here are a small rekindling of my interest in this format. I will be posting more PowerPoint PDF files and short Video files on this medium and will be using this site more for general bee-related discussions. Look in the pull down menu for my preliminary efforts. If I can maintain my focus and direction, I hope to use this medium to communicate with beekeepers in a more efficient manner while I grow more competent in the electronic bee community. 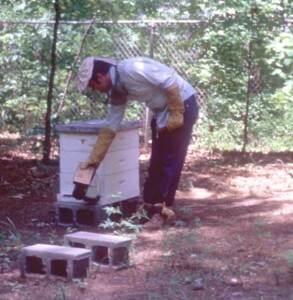 The pictured beekeeper is James E. Tew, 43 years ago, working his first hive at the Auburn University apiary. As a brand new beekeeper, I wore canvas gloves, an Alexander Veil, and taped my pant cuffs. I was crazy for bees. I still am.